Sunrise breaking over the hills of Tuscany is an enchanting experience. 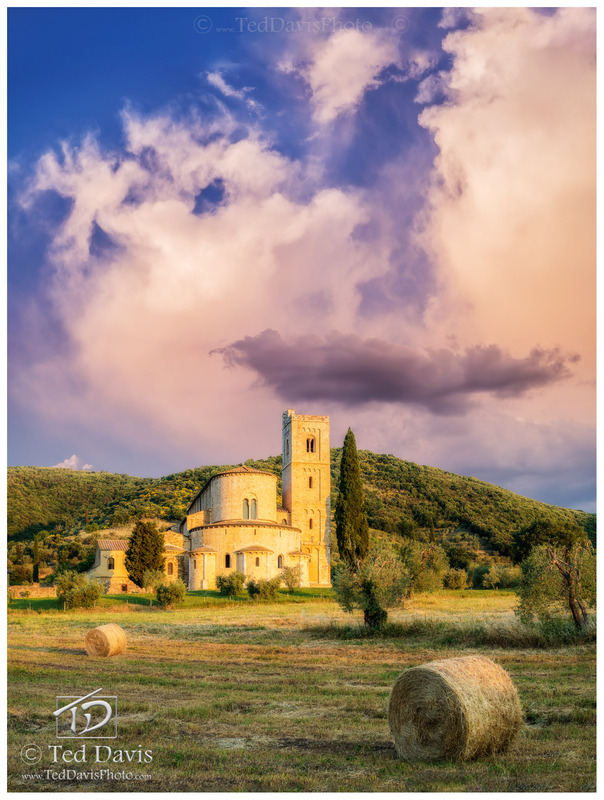 Nestled in a deep valley just south of Montalcino is the ancient Abbazia di Sant’Antimo, once a center of power controlling land from Pisa in the north to Grosseto in the south. Coming upon the Abbey during explorations in Tuscany, I knew I needed to capture the beauty of this fantastic church. As I set up the next morning, clouds began sinking in to the valley all around me. Biding my time, I was desperately hoping the sun would rise enough to clear the hills in the east and light up the scene before the cloud cover descended too much, covering the view. Ever so slowly the sun began inching down the tower, then the Ambulatory and finally the entire Abbey was enveloped in a golden glow. Quickly flipping my camera to a vertical position, I snapped the only shot I needed of the Abbey: lit up like a beacon with the new day’s light. . Photo © copyright by Ted Davis.